- Artistic activity : Composer, Lutenist (‘ūd - arabic lute) & vocalist. Success in the National Debate Lecturer Recruitment, July 2012..
Director and President of the organizing committeeof Carthage Music Days. Session 2 (March 2015), session 3 (April 2016) and session 4 (April 2017). More informations on this website. Success in the National Debate Assistant Recruitment, juillet 2010. Ph-D in Music and Musicology, Very Honorable mention. Title of thesis : The concert ‘ūd. Organological problematic, compositional space and semiotic modeling, directed by the Professor Jean-Marc Chouvel. ➤ Read the abstract on the thesis database in France. Follow this link. ➤ Read the thesis (flash book). Follow this link. ➤ Consult the musical excerpts of the thesis. Follow this link. DEA (Advanced Studies Diploma) in Ethnomusicology, Very Good mention. Titre of the dissertation : Musical aspects of therapeutic ritual by the Ṣṭumbâlî of Sfax, Tunisia. ➤ Read dissertation on this link. Mastery in Music and Musicology, Higher Institute of Music of Sfax, Very good mention with the congratulations of the jury. Title of the dissertation : The music of the blacks "Zunûj" of Sfax : Ṣṭumbâlî. ➤ Read the dissertation on this link. Bachelor's degree in experimental sciences, Good mention. Amine Beyhom & Hamdi Makhlouf, « The fretting of the ‘ūd in arabian music theory and its interaction with practice », In : Music and its instruments, Proceedings of the Interdisciplinary Music Congress (CIM), Paris, october 2009, dir. Michèle Castellengo & Hugues Genevois, p. 85-98. ➤ Book details. Follow this link. ➤ Download full article. Follow this link. ➤ Experimental Video (Al-Kindi fretting). Follow this link. ➤ Experimental Video (Al-Ibn al-Tahhan fretting). Follow this link. 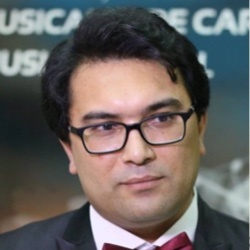 Hamdi Makhlouf, « The interpretation of the concert ‘ūd music : what analysis ? what meaning ? », In : Music interpretation, Proceedings of the 6th European Congress of Music Analysis (oct 2007), collected and introduced texts by Marie-Noëlle Masson, Preamble by Ludwing Holtmeier, p. 149-156. ➤ Download the article. Follow this link. Hamdi Makhlouf, « Emotional experience of the contemporary arabic ‘ūdist(lutenist) », In : Music, Signification and Emotion, dir. Mondher Ayari & Hamdi Makhlouf, p. 333-356. ➤ Book commentary by Theresa Schmitz (Transposition revue). Follow this link. ➤ Buy the book. Follow this link. Hamdi Makhlouf, « Music therapeutic dimension of the sfaxian Ṣṭumbâlî rite », RTMMAM Review of the musical traditions of the Arabic and Mediterranean worlds, N°2, Musicology of religious traditions, p. 149-166. ➤ N°2 edition details. Follow this link. Hamdi Makhlouf, « Composition, interpretation and figuralism in the music of the concert ‘ūd. Hearing analysis of l'Abri d'Al-Amiriyya by Naseer Shamma », Musimediane (multimedia revue), N°3, Unwritten music. ➤ Read the article. Follow this link. Study day : Analysis of musical discourse and new technologies, ATuReMM (Tunisian Association for Research in Music and Musicology) & URADM (Analysis of Musical Discourse, Research Unit). Some terminological and historical references to musicology. Conference and moderation of a debate, "Theme and Debate" about The Separation between Music and Musicology at the Higher Institutes of Music in Tunisia : what restructuring ?. From the compositional idea to the form of the musical work in the concert 'ūd music : Analysis and signification through an example of the trio Joubran. Aesthetic and Cognition Seminar : Theories of art and cognitive phenomena, Session N°13 : Aesthetics, cognition and compositional issues, organized by Jean-Marc Chouvel, Hugues Dufourt, Xavier Hascher and Costin Miereanu. Emotional experience of the contemporary arabic 'ūdist (lutenist) : compositional idea and creative process. Cycle of conferences "Music and Emotion". Interpretation of the concert 'ūd music : What analysis ? What meaning ? 6th European Congress of Music Analysis : Interpretation. The song Ra' al-habîb (The lover touched) : interaction between music and meaning. Conferences series around Om Kalthûm.